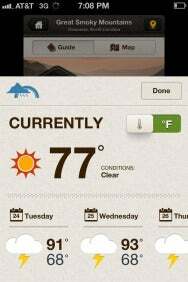 The Week in iOS Apps: Clear, or coy? How you feel about National Parks by National Geographic will largely hinge on whether you run the app on your iPhone or your iPad. And your appraisal of the National Geographic Society’s app will further be influenced by whether you download the park guides available through the app. Park Place: Among the data you’ll find in National Parks by National Geographic are current weather conditions, including a forecast for the next few days. Let’s tackle the former issuer first. 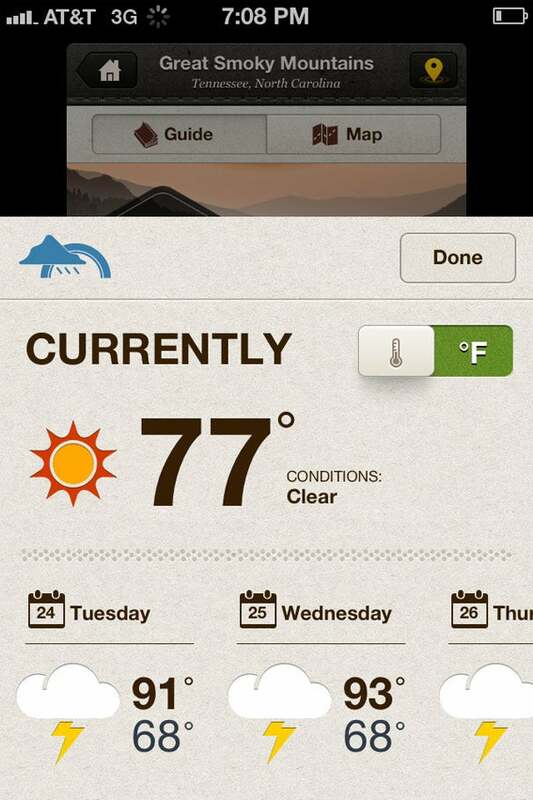 National Parks runs on the iPhone, iPod touch, and iPad. Use it on devices with smaller screens, and you’ll get a competently organized set of facts and figures for 20 national parks. Select a park, and you’ll see buttons that can give you dynamically updated weather information and forecasts along with stats on how many people visited the park in 2011. Tap around a bit, and you can find basic park information such as how to get there, when to go, and what sites you should make a point of seeing should you visit the park. Other information on entrance fees, accessibility, pets, and other visitor services should also come in handy for planning a trip, as well a page of camping and lodging information. A map tab shows the park with colored pins depicting points of interest, campsites, and photos. (You’ll need to tab on an info button to figure out what’s what.) It’s all very nice looking on an iPhone screen, though not particularly breathtaking. On an iPad, however, the view is outstanding. National Geographic uses the tablet’s larger screen to full effect, so that there’s less tapping around. The How to Visit and About The Park sections appear on an individual park’s main page, and park info, directions, and camping data are accessible in helpful pop-up windows. The Map tab could still use some more helpful labeling on the iPad, but when you select one of the picture pins, the image fills the entire screen of your tablet. What’s sort of so-so on the iPhone becomes very impressive on the iPad. 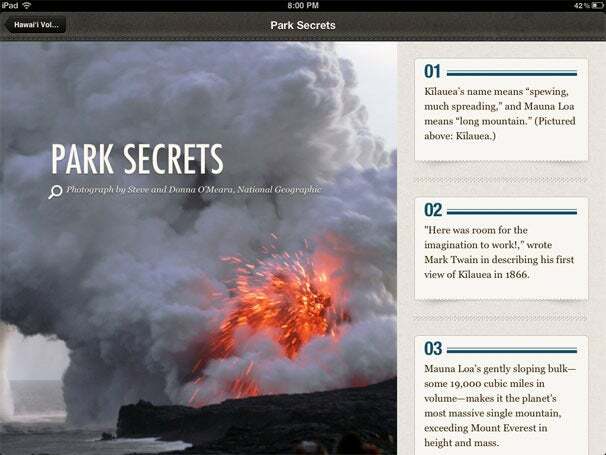 National Parks by National Geographic is a worthwhile tool for planning your next visit to a national park, particularly if you’re willing to download the individual guides for each park. That said, the app suffers slightly from a limited scope: There are 58 national parks, after all, and this app contains information on not even half of those. I would like to see Carter Lake, Dry Tortugas, and Lassen Volcanic afforded the same treatment that Yellowstone, Glacier, and Acadia currently enjoy. And I’m pretty sure other national park enthusiasts and travelers would feel the same.